Have you ever gone to a picnic or a hike or just any outing and all you need is some relaxing music to add to the fun? But then you find it impossible since you cannot carry your woofer or a music system with you everywhere you go? Are you in your room or just walking around your compound and you need some relaxing music? Or are you just tired of having to listen to your music by the use of earphones and you need to connect your phone to some sort of an amplifier? Then worry no more for we got you covered! Sony Portable Mega Boombox provides a solution to all of your music problems. Here is our informative review so you can be confident with this product and you can know why you should use Sony Portable Mega Bass Stereo Boombox for your music needs. Why you buy Sony Portable Mega Stereo Boombox? NFC Wireless Bluetooth – Sony Portable Mega Stereo Boombox streams your audios wirelessly from devices that connect with Bluetooth and enables you to enjoy your audios from a distance of more than 30 feet away. This is possible without any cable connection. Pairing is instant with NFC Devices; to connect, just tap in order pair and your audio will be playing immediately. Sleep Timer- Plays your favorite audios while luring you to your sleep. It has four different play time lengths of 90, 60, 30, or 15 minutes of playing music relaxing you to your sleep. Dual Audio Inputs at the Front Panel – Sony Mega Stereo Boombox has a front panel USB input or a 3.5mm stereo auxiliary which is standard that enables easy connection with any preferred audio device such as an iPad, iPod, iPhone or your preferred MP3 digital players. This enables you to play music using the Sony Portable Mega Stereo Boombox. This feature also allows you to use the Headphone Output Jack at the Front Panel when listening to your music in private, and with no disturbance to your immediate environment. Portability- Sony Portable Mega Stereo Boombox has the ideal size for any room or working place. The ideal size enables you to carry it with ease, hence you can carry it anywhere; be it a walk, a picnic with your family or simply taking it with you from one room to the other. AM/FM Radio– Sony Portable Mega Stereo Boombox has a digital FM/AM Stereo Tuner that allows free FM and AM radio station tuning and allows you to select from a number of shows and music with a unique, clear stereo sound. 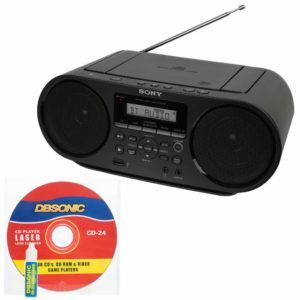 MP3 CD Player-Sony Portable Mega Stereo Boombox has this feature that allows you to listen to your old jam rocks or jazz or any of your desired music that has been recorded and stored on a compact disk. Easy to pair and connect: Unlike other music devices that takes too much time, and must be connected by the use of a cable, Sony Portable Mega Stereo Boombox pairs at just a tap and does not require cables to connect. Can use either a battery or direct AC power: Sony Portable Mega Stereo Boombox unlike other music devices can be connected to either direct alternating current power supply or can use a battery. This means that you can still use it when there is a power outage or when you are outdoors where there is no electricity. Allows privacy: This is another advantageous feature of Sony Portable Mega Stereo Boombox. It has a headphone output jack that allows one to listen and enjoy in private and also without causing disturbances to people around you. Allows a variety of use: Unlike other music devices that can only be used for one purpose, say playing music from a flash, Sony Portable Mega Stereo Boombox allows one not to only play music, but also to listen to AM/FM Radios. This gives one a variety to choose from; from the music in flash and CDs to the music and talk shows on the various radio stations. No remote control: Although it effectively gives music services much better than other devices, Sony Portable Mega Stereo Boombox does not come with a remote control and hence one has to operate it by the use of their hands. Although the device does not come with a remote control, it remains to be one of the most effective music devices available you can use. Most music systems are effective for indoor use and must use cables for connection. However, Sony Portable Mega Stereo Boombox can be used both indoor and outdoor and without requiring cables for connectivity. It is suitable for a picnic, a walk or simply for an amazing music experience!